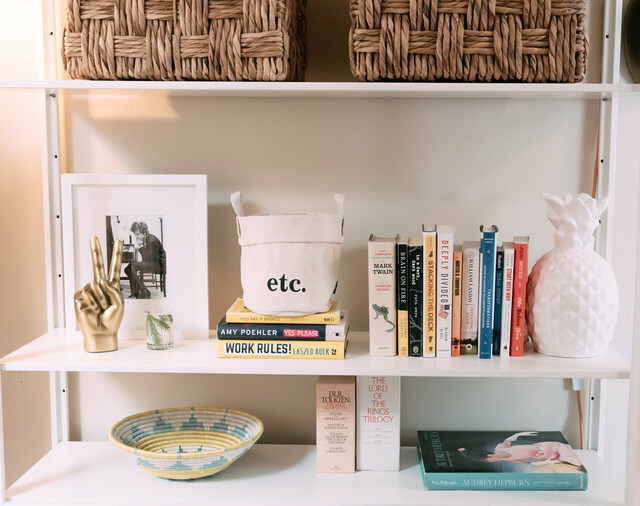 February 2018 – Dc to a "T"
As someone who admittedly likes to move things around and try out new decor super frequently, it’s hard for me to feel super “attached” to certain items (actually, that’s not 100 percent true…I just want to keep everything and switch it out as often as I please–if only I had the space!). However, there are several pieces that I’ve purchased over the past few months and even years and haven’t regretted for a second. First up is the Louis mirror I bought before moving into my current apartment. I’d been wanting one for awhile, and when Ballard Designs was having one of their sales, I went for it. I love the style–it’s elegant without being too over the top, so it goes with lots of different styles. It really completes my dresser area and is totally functional and big enough for me to get a good view of my outfit. My IKEA couch is something I mention in all of my home tours because it’s such a classic (at least in my spaces!). It’s held up wonderfully over the past four-plus years (minus several wine spills on the cushions, which I eventually replaced for good last summer by ordering a new slipcover). The only problem is that the new slipcover that IKEA makes is made of slightly different fabric than the sofa. I wouldn’t say it’s super noticeable, but it sticks out a little. I’ve also been really happy with the color–the gray goes with lots of different patterns and isn’t “loud” by any means. Trust me, you don’t need to have a $1,000 couch to tie your space together! I bought this lamp from Target last year and while it’s currently in our living room, it could really work anywhere. I purchased a standing version off of Craigslist when we moved in, and that one is downstairs as well. I love the modern look and the gold, although I wouldn’t say it provides the best light. Still, for the price and the cute look, it’s a fave! This jute rug from West Elm is everywhere, and for a good reason. I got ours on Craigslist right before moving in, and I snagged it for a steal (only $50! ), which was amazing! 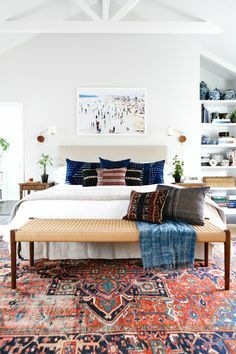 It’s such a popular rug and is totally comfortable on its own (I was worried about the texture of the jute) or would look good with a colorful rug layered over it. It doesn’t shed too much (another concern of ours), although I’ve noticed little fibers on my clothes if I’ve been sitting directly on it. Call them unnecessary or overpriced (I won’t challenge you) but Diptyque candles are such a fun luxury item to have at home. They smell amazing, look stylish even when they’re empty, and add the right amount of glam to any space. This past summer, I had the chance to visit the Diptyque store while I was in Paris, and it was a dream–so many good smells! What’s on your “must list” in terms of home items? Happy Monday! But really, HAPPY MONDAY if you also have the day off today! This three-day weekend fell at exactly the right time, if you ask me. I’m still in the 90-day period at my new job where I’m not allowed to take days off, so federal holidays are as good as it gets! 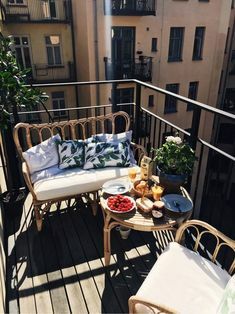 In an effort to really make my lofted room feel all the more cozy (and to play up the architectural elements), I’ve been looking to Pinterest for inspo (as usual) and have found so many images that capture exactly what I’d love to recreate. This post is picture-heavy, but can you blame me?! 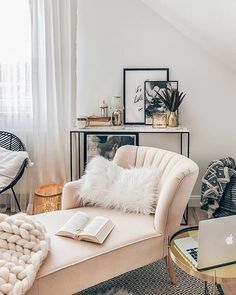 Each of these spaces just looks so relaxing and comforting and the best part is that they’re free of STUFF (because truly, who can relax when there are piles of papers/magazines/clothes everywhere? Love the pattern play and the gold sconce. Need a bench like this–love the rustic look! Ok, talk about rustic perfection. 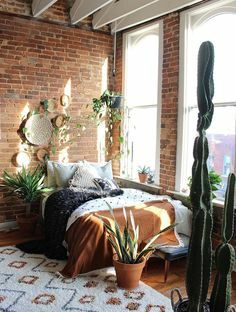 This space is goals! Swooning! Those lights and that bed frame. This spot is collected but calming. 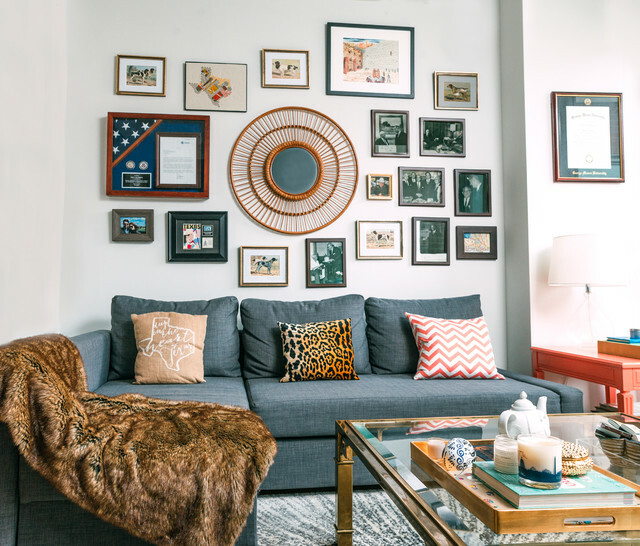 I also am obsessed with this Apartment Therapy tour that is basically the essence of all of the images above. The best part? This cute little space doubles as an Airbnb, so you can stay there and check it out for yourself! Also, if we aren’t Pinterest friends yet, add me right this way! I alternate between needing a lot of friend/social time and a lot of time alone, so oftentimes, a cozy night in is just what I’m craving (preferably on a Friday night–by Saturday, I have a lot more energy and hate sitting still!). Whether I’m watching a new show, immersed in a book (thrillers are perfect for nights in), or even just scrolling through Pinterest planning my millionth bedroom redo, I love just taking a few hours for myself (with red wine and maybe some dark chocolate, of course!). -Cozy loungewear. I’m one of those SUPER weird people who will just stay in jeans/work clothes until it’s time to get ready for bed (I know…). I’ve never come running home ready to change into sweatpants (and I think it’s really just a lazy thing…I’m definitely not wearing my blazer at 8 pm for any particular reason otherwise, haha). Lately I’ve been making more of an effort to shower/put on comfy clothes earlier in the night so that I can still enjoy a few cozy hours of reading/watching tv in bed before it’s time to turn the lights out. -A drink. Wine, tea, hot chocolate, you name it. If you’re trying to avoid late night snacking, pour yourself a glass of something instead. Plus, if you’re sitting in bed, you won’t have to deal with crumbs and popcorn kernels getting everywhere (although let’s be honest, my bedspread has seen many a wine spill in its day). -Cozy socks. I’m also one of those weird people who sleeps in socks no matter the season (trust me, I got a lot of comments about this one in college…). But cozy socks (like those fun, fluffy ones) make everything better (I’ve been known to sleep in them for days on end, even in warm weather months…). -A blanket. I absolutely love my throw blankets and get a ton of use out of them (they’re more than purely decorative!). Head to HomeGoods/TJ Maxx to pick up a soft but inexpensive option. -A candle. I’m trying not to run through my new Diptqyue so I’ve been alternating between a few different scents at night, and they really do make a difference! -Minimal phone use. Stop scrolling through Instagram/Facebook/Bumble/work email/cat videos for a minute and put your phone aside while you relax. It’s hard to focus on calming down when constant distractions pop up. Happy Thursday! Who else is looking forward to a three-day weekend? My mom and I are thinking about possibly doing a day trip or something along those lines, destination TBD. I can’t believe it’s already mid-February, it feels like the month just started! Hart of Dixie. I mentioned this last Friday, but the obsession is still real. Before I started watching, I had been picturing it to be a Southern Grey’s Anatomy or something, but the medical component of the show is super minimal (making it a little more boring at times but it’s also kind of nice to not have to watch people being sliced in half every minute–I always joke that it took me two seasons of Grey’s to be able to eat while watching, haha). I’m also iffy on whether I love Rachel Bilson or not (I never watched the OC or anything, so I can’t really compare her in this show to any of her other roles), but I’m entertained for now (cheesy shows are addicting for a reason, right?). This pillow. I found it on sale at Target the other week when I really needed a pick me up and it was just so soft that I couldn’t say no! It’s funny, though, because I keep walking into Target and browsing the home section and just not wanting to leave with anything (which is good for my wallet!). I love all of the new items but also kind of feel like I’d have to redecorate my entire room/apartment to make them work, if that makes sense. I don’t know. Baking. Ok, by baking I really mean making, like, no-bake cookies because I have no talent in the kitchen whatsoever. However, I’ve been bookmarking a few recipes on Pinterest (mostly involving PB and chocolate) and made these over the weekend. I brought the extras in to work earlier this week and they were a hit (plus they’re SO easy to whip up). Hat walls. The other day I posted an Insta story asking what I should do on the wall above my desk, and while I got several great suggestions, my favorite was to do a hat wall! 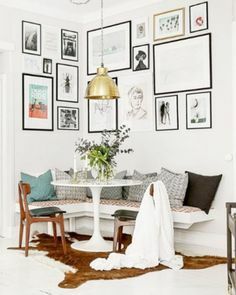 I love how the one above looks (and am also a fan of the one at the top of this post) and am hoping to recreate something similar if I can pull it off! Half-Baked Harvest. Who else has been following Olympic gold medalist Red Gerard? Pretty incredible! If you didn’t know, Red’s sister Tiegan is a pretty famous food blogger/’grammer, and her recipes look amazing. Go follow her if you don’t already (pretty sure I was living under a rock until I read about her last week while stalking their family, haha. Talk about an accomplished group of siblings). Also, can I move into her barn?! This apartment tour. I think Lauren and I could easily be BFFs…sorry, all, moving to NYC to watch SATC marathons in her cute living space. I don’t think I could ever personally deal with the lofted bed situation, though…walking up the spiral stairs to my room every day is complicated enough! Oh, and one more thing, but because I’m nosy…this list shows how much people spend on engagement rings in each state. I should really just add a tab on the blog with all of these home tours so that you can check them out whenever! If you follow me on Instagram, you’ve probably heard me mention the amazing ladies I’ve met via my Houzz freelancing–if you didn’t know, I started contributing to the publication last May and have had a blast! 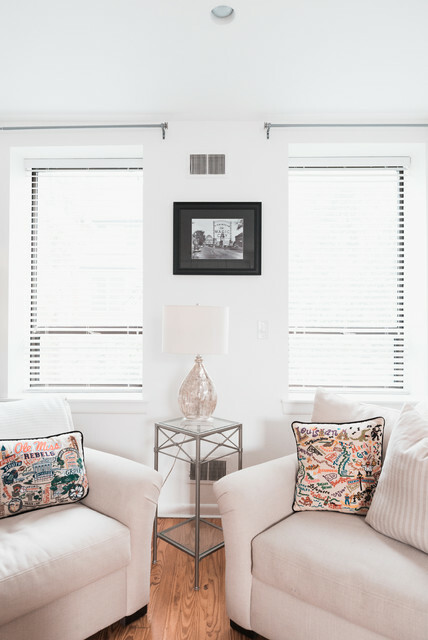 It’s been a wonderful way to meet fellow creatives in the DC area and profile their gorgeous homes while earning a little extra cash along the way. Writing about interior design and scoping out people’s Insta feeds? Basically what I do on here every day anyway! I work in conjunction with Ryan Hicks, the photographer who shot my home in January 2016, and he’s gathered some amazing shots of people’s apartments and homes. 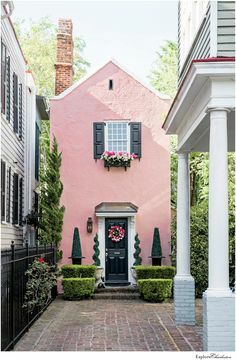 Now that I’ve done several of these tours, I wanted to include them here so that you, too, can admire these awesome homes (these ladies also all have amazing blogs/Instagram feeds, so follow away!). I know I’ve gotten tons of design ideas from the places I’ve profiled! I had been following Liz on Instagram for awhile and was always obsessed with how calming and collected her home looked with it’s soft color palette and feminine details. Her apartment has a really interesting layout with the bedroom kind of coming off the hallway where you walk in, and she’s totally made it work so that the setup feels peaceful and cohesive–I’m totally inspired! View her Houzz tour here. Libby is the queen of color and her apartment totally reflects this as well. 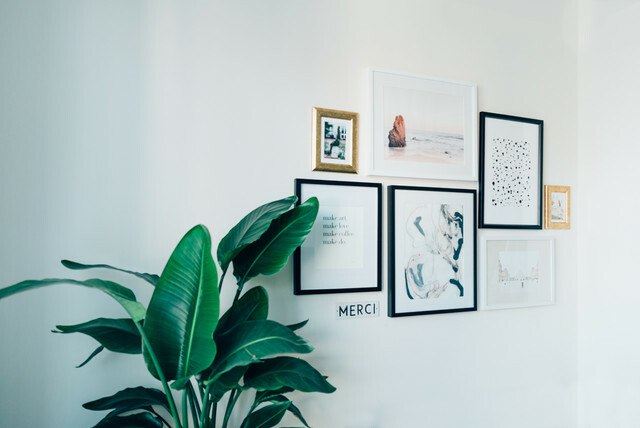 Any Gray Malin fan will swoon over the prints Libby has in her bedroom, and I absolutely love how she incorporated family photos into her decor–such a sweet touch! Also, that light up sign! View her Houzz tour here. Ashlee and her boyfriend have such a fun, Southern-themed apartment complete with lots of personal and practical touches. 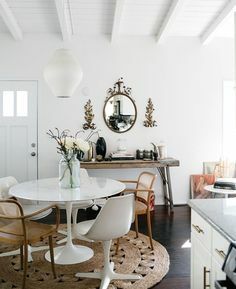 They were the first couple that I profiled, and I love to see how men and women style their spaces together, especially since I’ve only ever lived alone/with other girls–it gives me hope that spaces can still look cute even when there’s a guy living there! 😉 Like Liz, they took a nontraditional layout and really made it work! View her Houzz tour here. 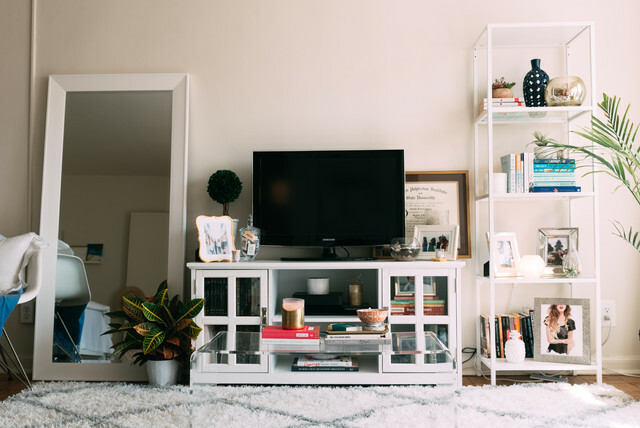 I loved seeing what Jenn did to her space after having moved into her own studio apartment, which is complete with girly touches and tons of cute accessories. Her space is proof that a small space can still be glam and welcoming–how great is all of that sunlight, too?! View her Houzz tour here. Heather and Adam also decorated their apartment as a couple, and it was great getting to chat with them both during the shoot. I love admiring their amazing gallery wall in person and hearing about Heather’s fun furniture finds. 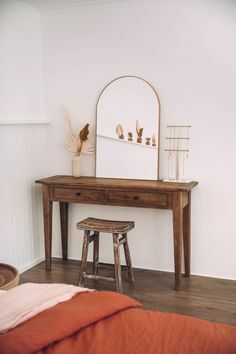 They took a modern-looking unit and made it entirely their own with lots of sentimental touches and creative uses of space, like Heather’s desk area. View her Houzz tour here. Even with a new baby, Ariel‘s home still looks fantastic and she’s basically a girl after my own heart thanks to all of her thrifty finds. Her vintage bar cart is the coolest and looks great! I loved hearing about the DIYs she and her husband did, even if they’re way beyond my abilities! View her Houzz tour here. Julie is also the queen of DIY, and I think every girl wishes they had her office space! 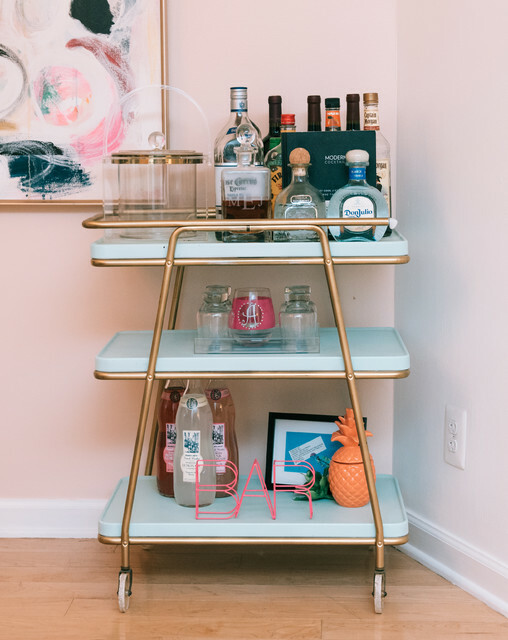 I also love her creative use of bar carts throughout the house and ALL of the Katie Kime. View her Houzz tour here. Alysse‘s apartment is perfectly boho-chic with tons of greenery and midcentury modern pieces. She and her boyfriend also decorated together and did a really nice job combining their individual belongings with some new items and DIYs–I know I felt right at home when I walked in! View her Houzz tour here.